And He feeds me and quenches my thirst and when I fall sick then He (Allaah) cures me. [Soorah Shu'araa: 80]. Some scholars of Tafseer explain that there is a relation between what we eat and drink and falling sick since most people fall ill because of their diet. This could be a reason why Allaah mentioned that Ibrahim (peace be upon him) recognized that Allaah is the One who provides sustenance for us but that sickness is due to our own self and this is why sickness is mentioned after food and drink in this verse. And We sent down of the Qur'an that which is a healing and a mercy to those who believe. [Soorah Israa: 82]. A healing to 'those who believe' showing the importance of rectifying our belief and actions such that we are true believers if we want the Qur'an to benefit us. And remember Ayub when he cried to his Lord: Verily, distress has seized me, and You are the Most Merciful of all those who show mercy. [Soorah al-Anbiyaa: 83]. We answered him and removed the distress that was on him... [Soorah al-Anbiyaa: 84]. O mankind! There has come to you a good advice from your Lord (Qur'an) enjoining all that is good and forbidding all that is evil, and a healing for that which is in your breasts, a guidance and a mercy for the believers. [Soorah Yunus: 57]. cure for our hearts from all diseases. 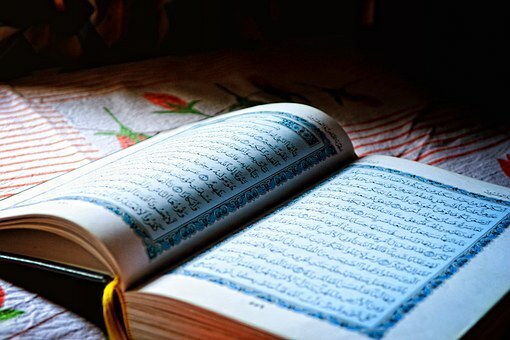 Say: it (the Qur'an) is a healing for those who believe, a guide and healing... [Soorah Fusilaat: 44]. The Messenger (sallallaahu alayhi wasallam) said, "There is no-one who is afflicted by distress and grief, and says: 'Allaahumma inni 'abduka ibn 'abdika ibn amatika naasiyati bi yadika, maada fi hukmika, 'adlun fiy qadaa'ika. As'aluka bi kulli ismin huwa laka sammayta bihi nafsaka aw anzaltahu fi kitaabika aw 'allamtahu ahadan min khalqika aw ista'tharta bihi fi 'ilm il-ghayb 'indaka an taj'al al-Qur'aana rabee' qalbi wa noor sadri wa jalaa' huzni wa dhihaab hammi (O Allaah, I am Your slave, son of Your male and female slaves, my forelock is in Your hand, Your command over me is forever executed and Your decree over me is just. I ask You by every name belonging to You which You have named Yourself with, or revealed in Your Book, or You taught to any of Your creation, or You have preserved in the knowledge of the Unseen with You, that You make the Qur'an the harvest of my heart and the light of my chest, and a departure for my sorrow and a release for my anxiety),' but Allaah will take away his distress and grief, and replace it with joy." He was asked: "O Messenger of Allaah, should we learn this?" He said: "Of course; everyone who hears it should learn it." And if Allaah tests you with affliction, there is none who can remove it but He. [Soorah Yunus: 107]. And He will give you victory over them and heal the breasts of a believing people. [Soorah Tawbah: 14]. Abu Hurairah reported that the Messenger (Sallallaahu Álayhi Wasallam) said, "When you are about to sleep recite Ayatul Kursi till the end of the Verse for there will remain for you a protection from Allaah and no devil will draw to you until morning." [Saheeh al-Bukhaaree]. The Messenger (Sallallaahu Álayhi Wasallam) also said, "whoever recites the last two Verses of Soorah al-Baqara at night, those two Verses shall be sufficient for him." [Saheeh al-Bukhaarree and Saheeh Muslim]. When retiring to his bed every night, the Messenger (sallallaahu alayhi wasallam) would hold his palms together, blow into them, recite the last three chapters of the Qur'an and then wipe his entire body as much as possible with his hands, beginning with the head and face and then all parts of the body. He would do this three times. [Saheeh al-Bukhaaree and Muslim]. Aisha (may Allaah be pleased with her) said, "When someone fell ill from the Prophet's family he did 'nafath' on them (to blow three times over them reciting the two chapters of seeking refuge -Soorah al-Falaq and Soorah An-Naas). When he himself fell ill, the illness which lead to his death& I would (similarly) do 'nafath' on him and would wipe him with his own hands for it was more blessed that my hands." [Saheeh Muslim]. We answered his call and delivered him from the distress. And thus We do deliver the believers. [Soorah anbiyaa: 87-88]. And you will remember what I am telling you, and I leave my affair with Allaah, verily Allaah is ever watchful over His slaves. [Soorah Ghaafir: 44]. So Allaah saved him from the evils that they plotted (against him), while an evil torment encompassed Fir'aun's people. [Soorah Ghaafir: 45]. It is also a cure when read over the sick. They are cured by the permission of Allaah because the Messenger (sallallaahu alayhi wasallam) said to Abu Sa'eed al-Khudri (may Allaah be pleased with him) after he (Abu Sa'eed al-Khudri) read it over a person who had been bitten by a scorpion and was cured, "How did you come to know that it is a cure?" [Agreed upon, Saheeh al-Bukhaaree (2276) with the additional wording, "You have done the right thing. "].